EMBARQ Turkey’s Livable Cities Symposium will highlight the importance of bikeability and walkability in creating livable cities for all. Join the discussion online using #LivableCities. Photo by Marko Anastasov/Flickr. Over the past half-century, the world has urbanized at an unprecedented pace. In 1970, about 37% of the world’s population lived in urban areas. This number rose to 45% in 1990, 54% in 2014, and is expected to reach 66% by 2050. Much of this urban growth is occurring in less wealthy cities, and has created distinct challenges. Many cities are struggling with insufficient infrastructure, traffic congestion, sprawling urban form, air pollution, and degraded public spaces. These challenges have become so apparent that they’ve given rise to a new paradigm in organizing and defining our cities: livability. Multiple indices from organizations including the Economist Intelligence Unit, Mercer, Monocle, and the OECD attempt to define this concept and rank cities according to their level of livability. Indices include crime rates, health statistics, sanitation standards, expenditures on city services, infrastructure, ease and availability of local transport, and residents’ social and economic standing. With these criteria in mind, EMBARQ Turkey and the İzmir Development Agency (İZKA) are co-hosting the second annual Livable Cities Symposium to examine how cities can improve urban transport to become more livable. What can cities across Turkey and around the world do to become more livable? On November 20, 2014, the Livable Cities Symposium will bring together more than 30 experts from ten countries to help answer this question. The Symposium will have a special focus on bikeability and walkability, which are core components of livability and create a number of benefits for cities. As a part of compact, connected cities, bikeability and walkability help improve road safety, reduce traffic congestion, and limit greenhouse gas emissions. For example, as a compact, bikeable, and walkable city, Barcelona emits about one-tenth as much carbon from transport as car-oriented Atlanta, despite their similar sizes. To help cities become more bikeable and walkable, the Symposium will feature sessions on pedestrianization, public spaces, urban cycling, innovative urban transport solutions, and Symbiocity – an integrated sustainable city concept from Sweden. Strategies to enhance bikeability and walkability have been gaining traction in Turkish cities. In Istanbul, pedestrianization of the Historic Peninsula increased walkability by creating a perception of safer streets and making a variety of transport modes more accessible by foot. The Metropolitan Municipality of İstanbul is also considering pedestrianizing Üsküdar – another historic area in Istanbul’s Asian side. In İzmir, Turkey, Karşıyaka – an important district home to more than 300,000 people – will be pedestrianizing its main artery to provide a safer and more accessible connection for various transport systems like ferry, rail, and public buses. The Municipality of Karşıyaka also aims to preserve the area’s historic heritage through pedestrianization. Improvements in urban livability in Turkey have not been limited to pedestrianization. Many Turkish cities like İstanbul, İzmir, Eskişehir, Sakarya, Antalya, Kocaeli, and Konya have either increased the length of their bike lanes or established bike-sharing systems. The recent bike-sharing system established in Kocaeli, for example, is one of the best systems in Turkey, and includes 15 stations with 120 bikes in a 30 km (19 mile) area. Istanbul, meanwhile, has committed to expand its bike lane network to 1,000 km (620 miles) by 2023. Bikeability and walkability also have a significant impact on public health. These forms of transport reduce local air pollution and help improve respiratory health. They also help residents incorporate physical activity into their daily commute. Turkey is one of many countries worldwide that experiences widespread obesity. According to a study conducted by the Turkish Ministry of Health in 2010, 64.9% of Turkey’s population is overweight, and 71.9% are physically inactive. By providing the necessary infrastructure to support biking and walking – two modes of active transport – cities can fight obesity and inactivity while benefiting the environment. 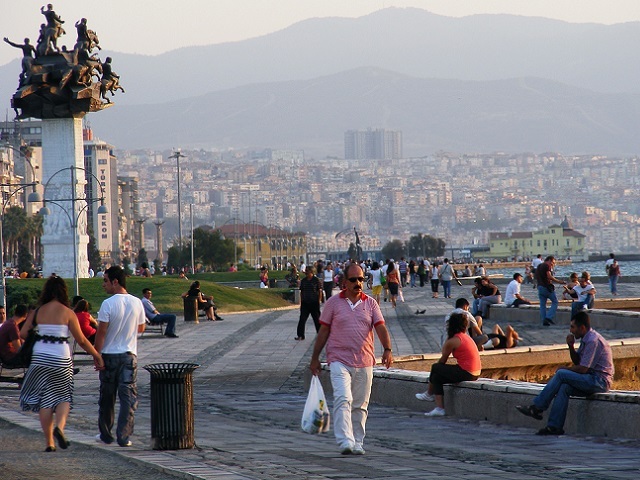 As the host city of the Symposium, İzmir claims the ambitious goal of becoming the most livable city in Turkey. The city has already promoted sustainable transport through pedestrianization projects, improving cycling with safe bike lanes and bike-sharing systems, and integrating public transport systems. İzmir established its bike-sharing system, called BİSİM, in January 2014, and has since attracted more than 80,000 users. The system consists of 311 bicycles in 29 bike stations serving the city’s 40 km (25 miles) of bike lanes. According to the 2014 to 2023 İzmir Regional Plan, sustainable urban development and sustainable transport are among the fundamental priorities to improve livability in the city. The Symposium will support İzmir, and cities throughout Turkey and worldwide to become more walkable, bikeable and livable. As cities around the world urbanize, spreading strategies for urban livability has never been more important. A version of this article originally appeared on embarq.org. You can register for the Livable Cities Symposium 2014 here. Don’t forget to follow online at #LivableCities.